The 75 Ah battery will be able to offer you up to 2 hours of runtime, which should be enough to mow about 2 acres of land. The model is also capable of reaching the speed of up to 8 miles per hour, making it one of the fastest riding lawn mowers on the market. It involves no belts, spark plugs, or filters, so it doesn't require a lot of attention in terms of maintenance. The LED headlights aren't particularly effective. This battery powered riding lawn mower is a powerhouse of convenient features and smart solutions. That said, the price is a bit stiff, so we would recommend this particular model to the environmentally conscious people first and foremost. The vehicle's virtually silent operation will allow you to mow the lawn in peace and quiet. The robust frame made of steel and aluminum casters ensures durability and reduced chassis flex. The stamped steel cutting deck is reinforced with heavy flat-stock steel, providing some additional strength and durability to the leading edge and the trim side. The air induction mowing technology draws air from the bottom and top of the deck, thus improving the grass lift. The model in question could definitely be classified as one of the better zero turn riding lawn mowers. It isn't the most efficient option on the market when it comes to the energy consumption but that is the price you ought to willing to pay if you wish to acquire arguably the most powerful lawn mower on the market. The 1.3-gallon fuel tank comes equipped with a fuel sight window, allowing you to keep tabs on the gas levels. The compact size of the model will allow you to easily reach the areas that are simply inaccessible to larger mowers. The manual power take-off is there to ensure fast blade engagement without any complications. The belt-drive transmission is outdated. 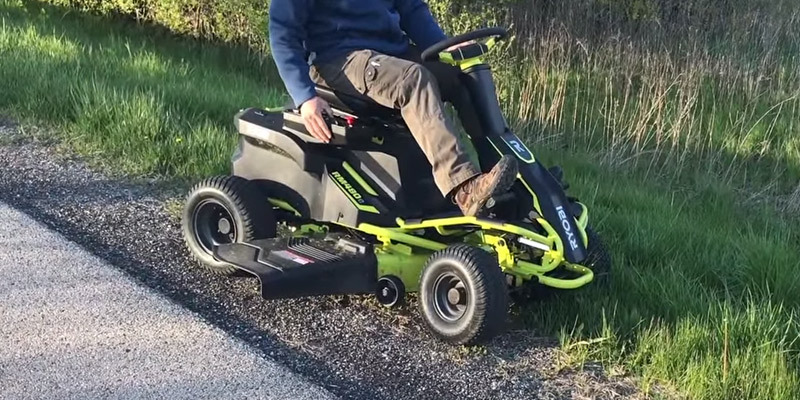 What we have here could probably be described as a mini riding lawn mower, so if you have a smaller lawn, this is a model that you might want to consider. And, keeping in mind that this is also one of the most affordable options out there, there's really no reason not to give it a try if you happen to be on a budget but would still like to enjoy the benefits of a riding mower. 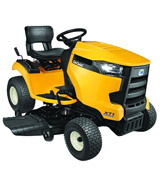 Cub Cadet LT46 XT1 Enduro Series Riding Mower, 46"
The front axle is made of heavy-duty cast-iron. The chassis features a fully robotically-welded frame with a new e-coating corrosion defense system. 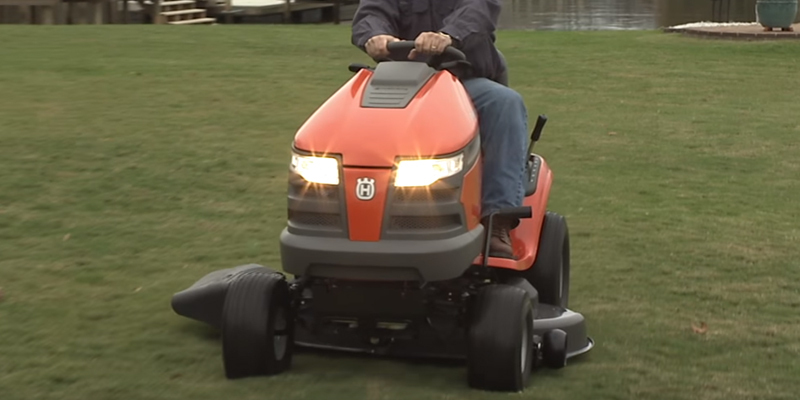 The LED headlight will allow you to drive this thing around your yard at night. The Cub Comfort™ high-back seat offers some additional comfort to the user with its 10-degree incline and slide. The stiff suspension will make you feel every bump. If you're looking for the best riding lawn mower for hills, the Cub Cadet LT46 XT1 Enduro Series Riding Mower is the model for you. If you have a sizable yard and you don't feel like spending hours mowing it with a less powerful and effective product, this is also the model for you. And if your yard is relatively small and all the ground is relatively even, this is a bit of an overkill. The step-through design will make the process of mounting and dismounting as comfortable and effortless as possible. The fender mounted deck lever with a spring assisted setup will ensure easy operation. The automatic CVT transmission will allow you to seamlessly adjust your speed just by pressing a pedal. The tires wear out relatively quickly. Whether the Husqvarna LTA18538 is the best riding lawn mower is up for debate. But it is definitely one of the most well-balanced models, offering users enough power to handle medium-sized lawns and enough comfort and convenience to make the entire process feel less like a chore and more like a source of relaxation. 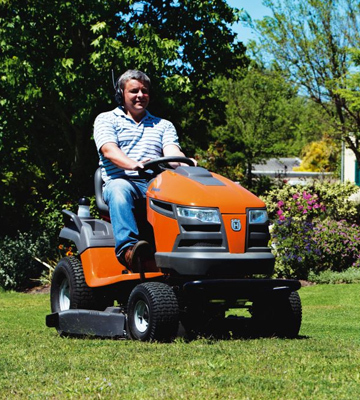 As a rule of thumb, the majority of riding lawn mowers run on gas as the sort of firepower they require to operate can be hard to achieve via other means of energy. Well, there's an exception to every rule, and the Ryobi RY48110 is one of the best examples of those exceptions. This is a vehicle that has quite a lot going for it and we will try to briefly touch upon every one of its aspects that we deem to be of some importance, but the most defining characteristic is easily the mower's engine. Instead of your standard engine that runs on gas, the model comes equipped with dual electric brushless motors. By removing fuel and fumes from the equation, the manufacturers present you with a much more environmentally friendly choice compared to traditional mowers. Of course, you might think that choosing a greener alternative would mean sacrificing performance and efficiency in return, but that isn't the case here. The 75 Ah battery will be able to offer you up to 2 hours of runtime, which should be enough to mow about 2 acres of land. The model is also capable of reaching the speed of up to 8 miles per hour, making it one of the fastest riding lawn mowers on the market. 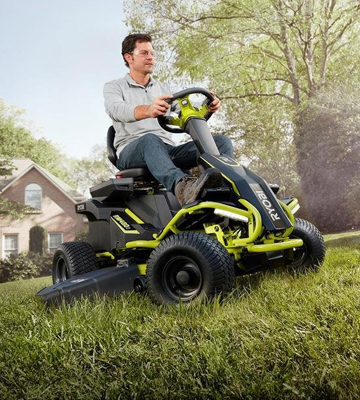 Now, it probably won't allow you to successfully compete in NASCAR, but the mower will offer you enough oomph to get the job done as quickly as possible. Before moving on from the electric engine and all that it entails, we would also like to mention one last benefit of this type of setup - low maintenance. That's right, a gas-powered engine doesn't just carry with it fuel emissions, but also a number of archaic components that require a whole lot of attention. 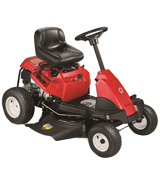 This electric riding lawn mower, on the other hand, involves no belts, spark plugs, or filters, so you won't have to constantly take care of those parts in particular and the mower in general. Well, aside from low maintenance, there's also the model's quiet operation that may have something to do with the electric engine. 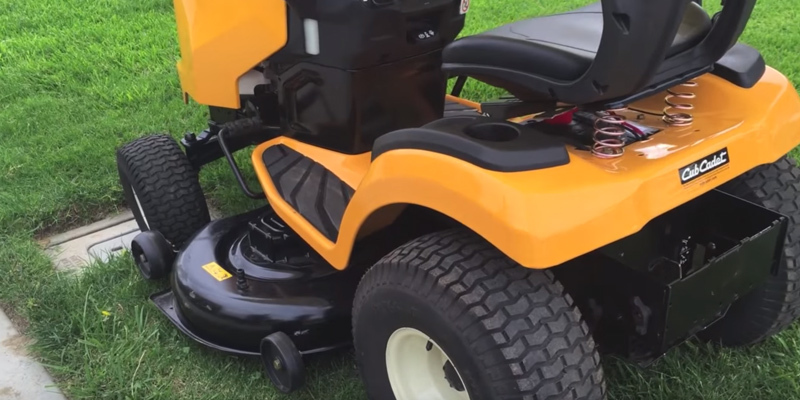 When it actually comes to cutting the grass, the vehicle comes equipped with quite a few features that make the entire process convenient and effortless. 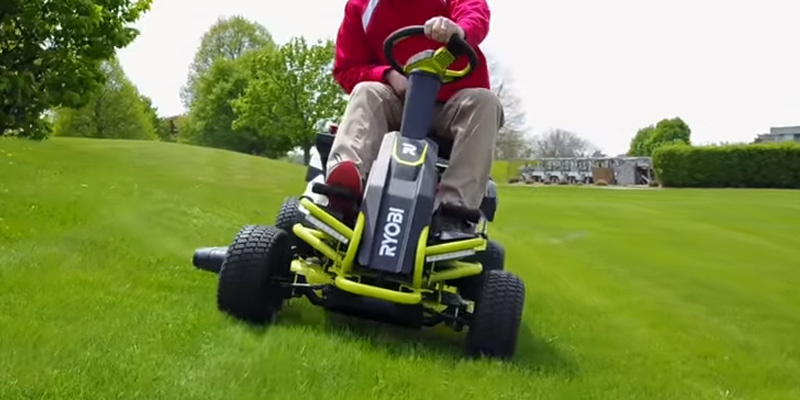 We like to believe that riding a mower like this one can be quite a lot of fun. But if you're not of a similar mindset or you simply happen to be in a less of a joyous mood on any particular occasion, the model has you covered with a cruise control feature that will do the bulk of the job for you. And, as you're cruising along, go ahead and plug your phone into the USB charger that was thoughtfully added to the control panel, along with a cell phone compartment and a cup holder. Plus, the adjustable seat will help you find the most comfortable position. Though some people find them less than effective, the LED headlights will help you cut the grass during the nighttime. 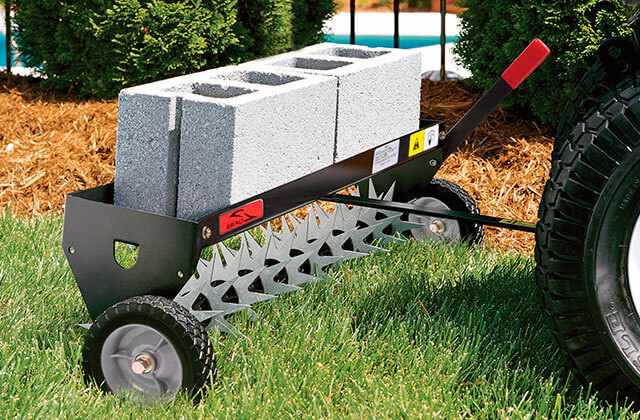 Finally, not all lawns are created equal, so the company behind this one made sure to implement a 12-position manual deck adjustment option that will allow you to adjust to any terrain and height of the grass in order to deliver that clean cut to your lawn. All things considered, this battery powered riding lawn mower is a powerhouse of convenient features and smart solutions. That said, the price is a bit stiff, so we would recommend this particular model to the environmentally conscious people first and foremost. The vehicle's virtually silent operation will allow you to mow the lawn in peace and quiet. 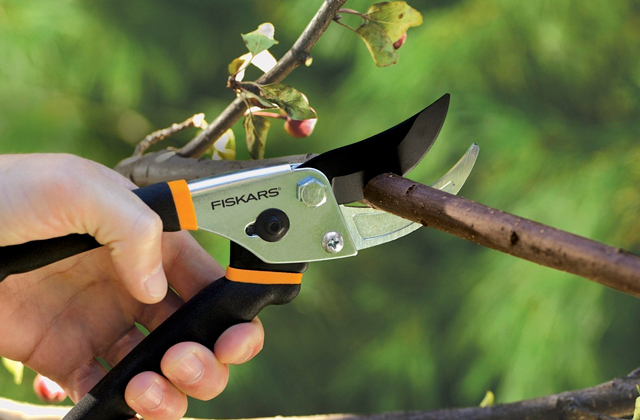 The particular model from Husqvarna is certainly not cheap, we will give you that much. But the price does make sense since what we have here isn't just a lawn mower but a proper vehicle that you could ride into battle if need be. 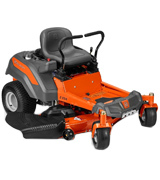 Though its performance is commendable, we would first like to focus on the rugged exterior of the mower. From the first glance, the product may seem more like something that belongs to the set of Mad Max than a machine designed simply to take care of some grass in your yard. But Husqvarna is the company that's always been known for constructing durable products capable of withstanding the rough and tumble of their respective environments, and the particular riding lawn mower is not an exception to that rule. The robust frame made of steel and aluminum casters ensures durability and reduced chassis flex. In addition to that, there's also the stamped steel cutting deck that is reinforced with heavy flat-stock steel. Now, it might seem like a bit of an overkill, but there are plenty of different lawns out there and that additional strength and durability placed on the leading edge and the trim side will be able to prolong the service life of this vehicle regardless of the type of terrain you're working with. And, in addition to the front bumper, the manufacturers also made sure to install a rear-engine guard, thus protecting the vehicle's front and back. As for performance, the first component we would like to highlight that attributes to that performance is the 23 HP Kawasaki engine, one of the most powerful engines on this particular market. 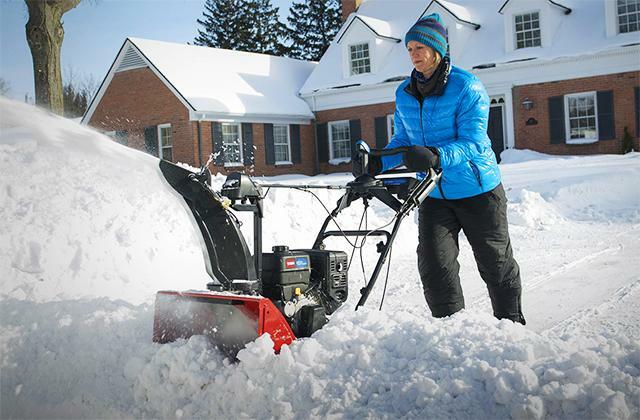 Paired with a 3.5-gallon fuel tank, it will be able to deliver hours of runtime, more than enough to take care of any medium-sized yard and even some of the larger ones. The previously mentioned cutting deck features 54 inches of cutting width and 3 blades, so it will take the model less time to handle the same amount of land compared to virtually any other prospect on the market. Aside from a whole list of impressive technical characteristics, all of which we probably wouldn't even be able to cover, there are also a couple of technologies that contribute to the model's performance. First off, there's the air induction mowing technology. Simply put, it works by drawing air from the bottom and top of the deck, which is a particularly useful solution since it improves grass lift and makes sure that the riding lawn mower delivers a superior cut. Taking care of gas-powered lawn mower usually requires some time and effort. Fortunately enough, that isn't the case here as the model comes equipped with integrated zero-turn hydrostatic transmissions. Compared to the outdated belt-drive setup, it requires virtually no maintenance, so you won't have to spend your time under the proverbial hood of this vehicle. And, if you don't mind, we would like to finish this review with the automatic choke system. This is a system that requires no user input and provides a simplified starting, so getting the whole thing up and running won't take a whole lot of effort. In conclusion, the model in question could definitely be classified as one of the better zero turn riding lawn mowers. It isn't the most efficient option on the market when it comes to the energy consumption but that is the price you ought to be willing to pay if you wish to acquire arguably the most powerful lawn mower on the market. Though certain people stick with regular lawn mowers due to their conservative viewpoints, it is the question of money that's the biggest reason most people don't make the transition to riding mowers. Your standard corded lawn mower generally costs about a hundred bucks, so just about anybody can afford it. Their riding counterparts, on the other hand, could cost you around thirty or even forty hundred dollars, so we're talking about a major investment here. 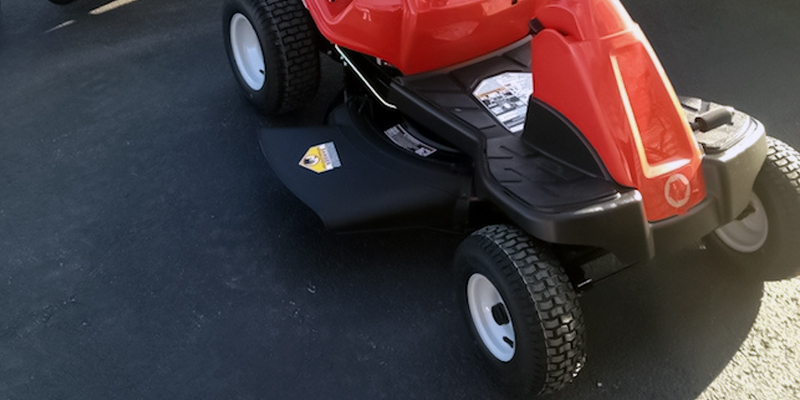 On that note, we would like to introduce the Troy-Bilt 382cc, one of the most affordable riding lawn mowers on the market that packs quite a punch for such an inexpensive model. First things first, the vehicle comes equipped with a fairly powerful 382cc OHV engine. Of course, with just 12 HP on board, it has its limitations, and you won't be able to move faster than 4.5 miles per hour. But we're talking about a model with just a 30-inch cutting deck, so it should go without saying that it is suitable mostly for small and medium-sized lawns. And when it comes to those, the mower boasts enough power to get the job done. Plus, talking about conveniences, the 1.3-gallon fuel tank comes equipped with a fuel sight window, which is quite an underrated feature as it will allow you to keep tabs on the gas levels. Though the smaller frame of the mower certainly presents a challenge or two when it comes to medium-sized lawns, it's not like it comes without its advantages as well. For instance, the compact size of the model will allow you to easily reach the areas that are simply inaccessible to larger mowers. Plus, the fact that it is relatively small, with just about 62 x 34 x 26 inches in overall dimensions, will prove to be a blessing in no disguise as you won't have any issues trying to find some space for it in your garage or a shed. 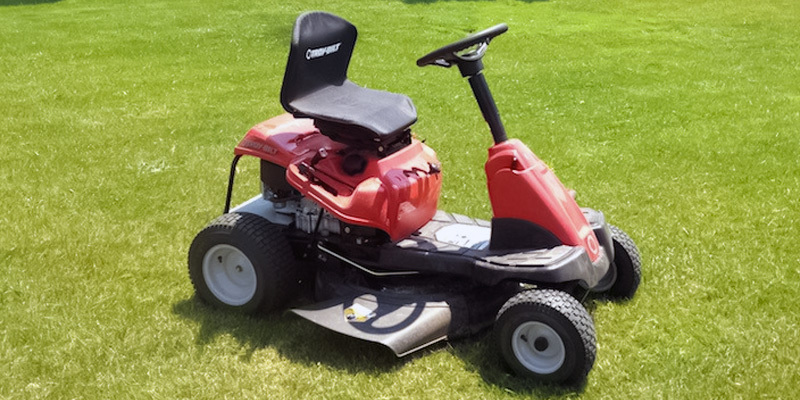 As we have implied earlier, this isn't the most versatile option on the market, but it is a good riding lawn mower in terms of comfort and convenience. The blades include 5 height adjustment options, so as long as you have a relatively even terrain in your backyard, cutting the grass and keeping your lawn clean will be a walk in the park. Plus, the manual power take-off is there to ensure fast blade engagement without any complications. All in all, with an 18-inch turning radius, you'll be able to easily maneuver around the yard. 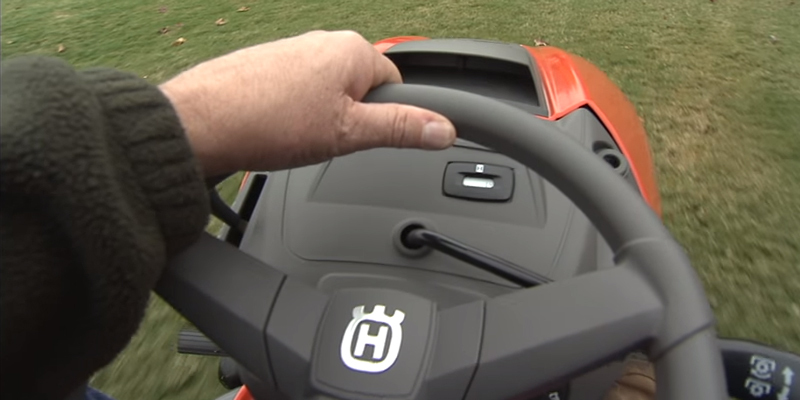 The 13-inch steering wheel has a soft grip to it that makes controlling the mower a process that is both simple and comfortable. Unfortunately, the only available cutting mode is self-discharge. However, you can easily fix this little issue by acquiring a bag and mulching accessories that are sold separately. 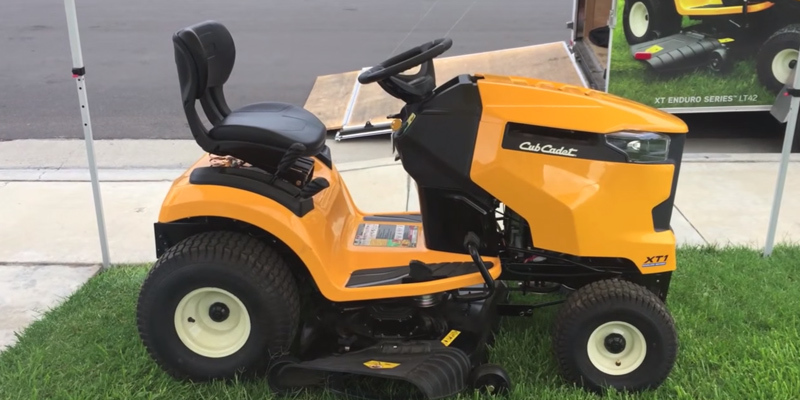 To sum it all up, what we have here could probably be described as a mini riding lawn mower, so if you have a smaller lawn, this is a model that you might want to consider. And, keeping in mind that this is also one of the most affordable options out there, there's really no reason not to give it a try if you happen to be on a budget but would still like to enjoy the benefits of a riding mower. 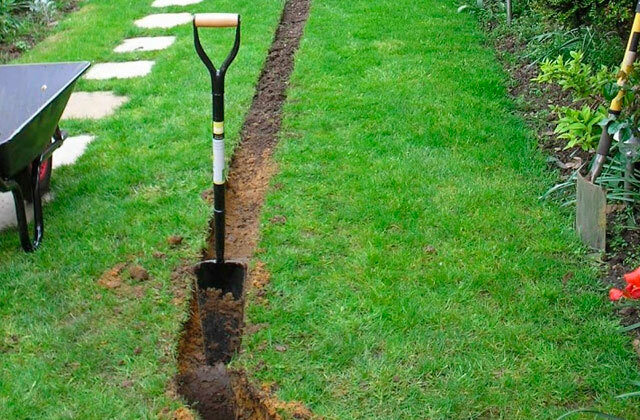 Taking care of a large lawn requires a lot of time and dedication. And, honestly, it is a monotonous process that bores the hell out of most people. Furthermore, the larger your lawn is, the more of a chance that it includes uneven terrain with a number of bumps and hills. Mowing that kind of lawn can be a nightmare, to put it mildly. That is unless you have the XT1 Enduro Series LT46 from Cub Cadet at your disposal. What we have here is a front-engine lawn tractor and that alone makes the model suitable for heavy-load jobs. 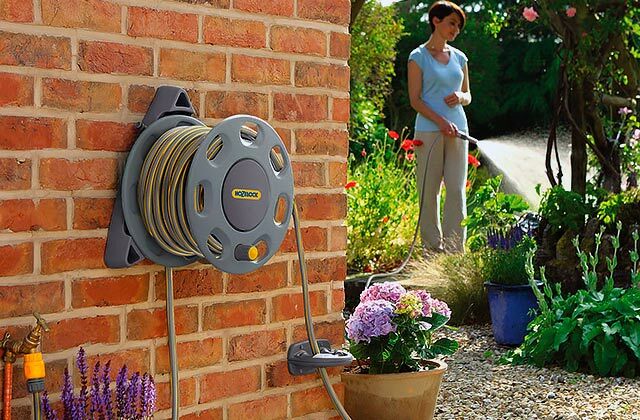 As the "enduro" part of the name suggests, this is a model that is built to endure anything your lawn might throw its way, from some serious bumps to the roughest grass. Though the whole thing is comprised of rugged materials that are as sturdy and reliable as it gets, we would first like to point out the front axle that is made of heavy-duty cast-iron. The people behind the mower in general and this particular component, in particular, are so confident in its endurance that they have decided to extend the warranty of the axle to 5 years. As for the other parts, the cylinders of the engine are made of twin and cast-iron as well, the transmission housing is comprised of cast aluminum, and the chassis features a fully robotically-welded frame with a new e-coating corrosion defense system. Again, not dissimilar to the front axle, the manufacturers have extended the warranty of the frame to 5 years as well. When it comes to performance, the 46-inch cutting deck driven by a powerful 22 HP Kohler engine will be able to handle even some of the larger-sized yards and the 3-gallon fuel tank will make sure that you won't have to refill the tank before getting the job done. The hydrostatic transmission drive offers simple and convenient operation as it essentially eliminates the need for shifting, just push a pedal and get going. And despite the fact that we're talking about a sizable vehicle, it offers a 16-inch turning radius, meaning that you will be able to maneuver around all kinds of obstacles with relative ease. Now, we could talk about the capabilities of this lawn tractor for hours, but everything that's already been said should allow you to paint a pretty accurate mental picture. So, before wrapping this thing up, we decided to mention a few features that either simplify the operation or make it more comfortable and convenient. First off, there's the SmartJet™ high-pressure deck washing system that simplifies the process of maintenance. Then, there's the Cub Comfort™ high-back seat that offers some additional comfort to the user with its 10-degree incline and slide. The cruise control option provides soft touch engagement and the LED headlight will allow you to drive this thing around your yard at night. All in all, this is a fairly simple choice. 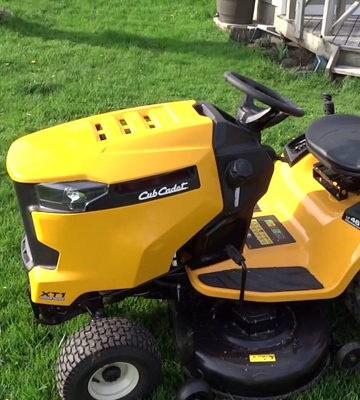 If you're looking for the best riding lawn mower for hills, the Cub Cadet LT46 XT1 Enduro Series Riding Mower is the model for you. 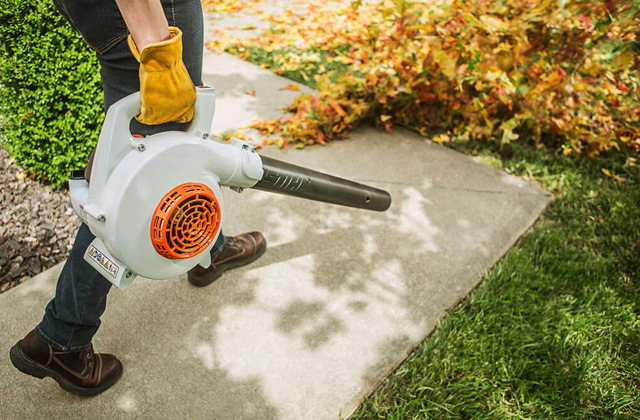 If you have a sizable yard and you don't feel like spending hours mowing it with a less powerful and effective product, this is also the model for you. And if your yard is relatively small and all the ground is relatively even, this is a bit of an overkill. The Husqvarna LTA18538 is certainly not the kind of unimpressive, run-of-the-mill product that doesn't necessarily have anything going for it. That said, this is definitely one of the most well-rounded and versatile ridings mowers on the market, so trying to highlight a particular feature, part, or an aspect that makes this model such a popular choice among a number of customers could be described as a bit of a challenge. But, since just about any vehicle starts with the engine, we reckon it is as good of a starting point as any to get things rolling. This is probably going to be a theme of this entire review, but the best words to describe the engine would have to be "capable" and "efficient". With 18.5 HP on board, the Briggs and Stratton Intek engine isn't the most powerful option on the market, but it is far above average, so to say that it gets the job done would be quite an understatement. Performance aside, the manufacturers have also equipped it with a full pressure lube system. Simply put, this system provides cooler operation, and that also carries with it longer service life. Now, we have mentioned earlier that we struggled with figuring out the most interesting or important aspect of this riding lawn mower. But if we had to pick one, it would probably be the automatic continuously variable transmission (CVT). With its help, you will be able to seamlessly adjust your speed just by pressing a pedal. And since the model is capable of reaching the speed of up to 7.4 miles per hour, it is important that you won't have to worry about hiccups and changes in speed that normally entail the shifting mechanism. 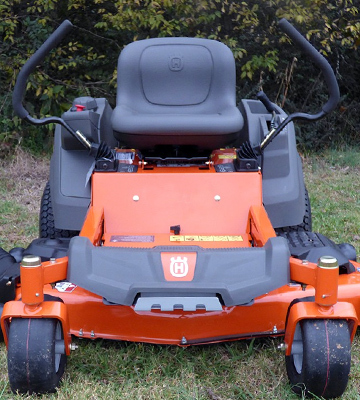 Of course, the model in question is a Husqvarna product, so those of you who are familiar with the company's mowers are also familiar with the air induction system that enhances airflow, allowing you to enjoy the benefits of an improved grass lift and a far superior cut compared to the majority of their competition. A 38-inch cutting deck will certainly struggle with larger lawns but it will also provide you with the opportunity to get into tighter spots, making it a great option for smaller yards. The step-through design will make the process of mounting and dismounting as comfortable and effortless as possible. Plus, there's also the fender mounted deck lever with a spring assisted setup to ensure easy operation. Though larger lawns might present certain challenges, the difference in the grass will not be one of them. With 6 available height adjustment positions, you will be able to adapt to all kinds of terrain and height of the grass. Finally, we would be remiss not to bring some attention towards the heavy cast front axle since it'd be hard to overestimate the importance of this little component when it comes to ensuring balance and stability. To rephrase our earlier point, whether the Husqvarna LTA18538 is the best riding lawn mower is up for debate. But it is definitely one of the most well-balanced models, offering users enough power to handle medium-sized lawns and enough comfort and convenience to make the entire process feel less like a chore and more like a source of relaxation and maybe, just maybe, even entertainment. 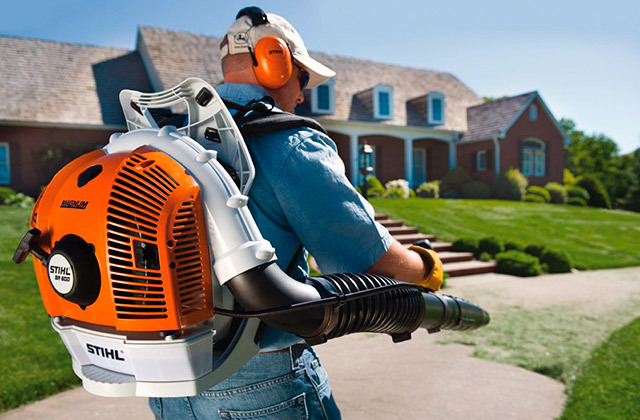 If you are a lawn owner, you know that cutting grass with a handheld lawn mower requires much time and physical effort. To solve this problem, you should ponder on purchasing a riding lawn mower. 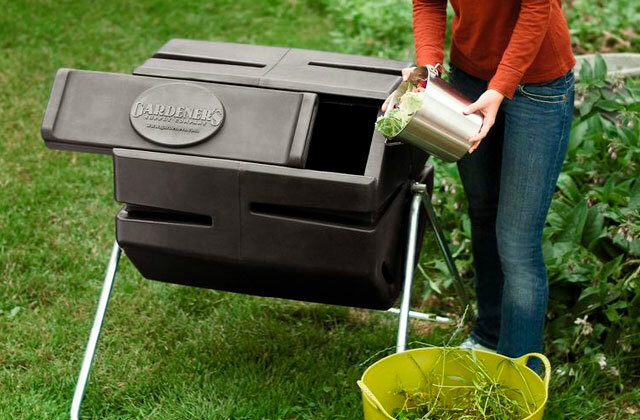 This device will take minutes to tidy up your grass. 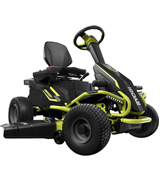 In general, a riding lawn mower combines features of a golf cart and a petrol lawn mower. Thus, all you need to do is adjust the height of the grass cut and ride this lawn mower. That's all! Besides, most lawn mower models allow carrying lightweight cargos and using attached implements for better grass cutting. Sure, even the cheapest options on the market may be more expensive than their stand behind counterparts, but the kind of performance and convenience riding lawn mowers offer you make that price well worth it. But if you have a small lawn in your backyard and want to keep it groomed, we advise you to consider our electric lawn mowers and gas lawn mowers. 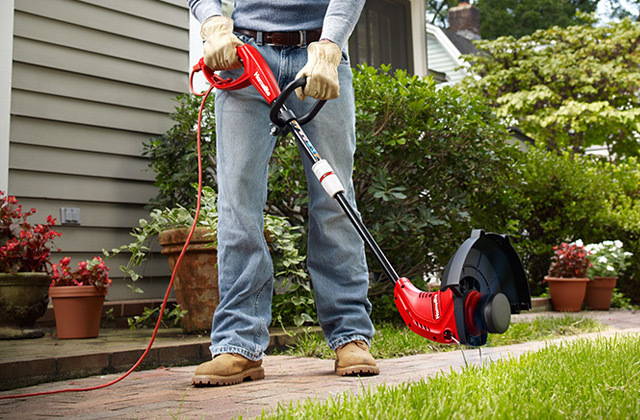 Thinking of the option to trim and mow your lawn effectively yet easy? A riding lawn mower will help. However, before you go buy one, decide on the type of a riding lawn mower you need and the terrain you’re going to groom. Basically, there are three main types of riding lawn mowers - Lawn Tractors, Zero-Turn-Radius and Rear-Engine Riders. The lawn tractors are highly-capable and performing riders, compatible with the variety of attached implements. More than other riding lawn mowers, they are suitable for heavy-load jobs. If you own a large, rough lawn, this one is the best to go for. Zero-Turn-Radius riders are designed in a way to easily maneuver and swivel in one place, enabling mowers to mow the areas with lots of all sorts of obstacles. 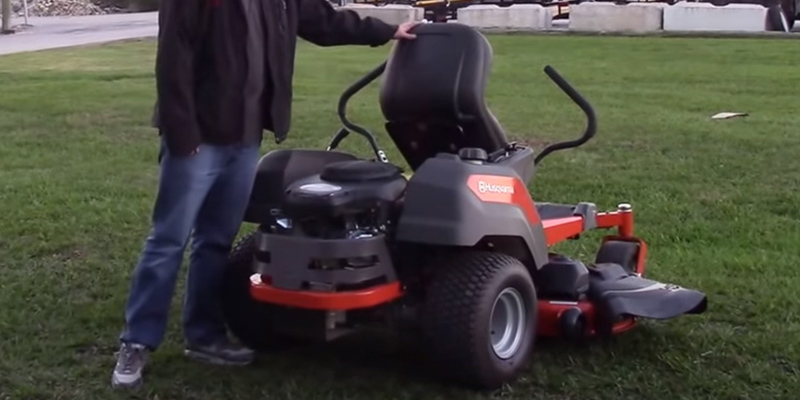 Rear-Engine riders are in many ways similar to Lawn Tractors, but they’re smaller in size. They work brilliantly on medium-sized lawns and terrains. The type of the engine directly determines overall mowing performance while its capacity specifies what jobs it’ll be best for. You may find quite a number of different configurations, but the most widespread types of engine are one-cylinder and V-twin two-cylinder. The riders powered by the one-cylinder motor are more basic and less expensive but they might not cut the grass as good and efficiently as those powered by V-twin two-cylinder. Still, they’ll do their work at best on half to one acre lawns. The riders based on V-twin two-cylinder are more performing and capable, they don’t heat up as fast and thus, last considerably longer when used for long-term jobs. The use of additional air filters and oil filtration system will greatly extend the service life of the engine, so beware. There are also several types of transmission that you just as well may want to consider since it strongly affects the ease of operation. 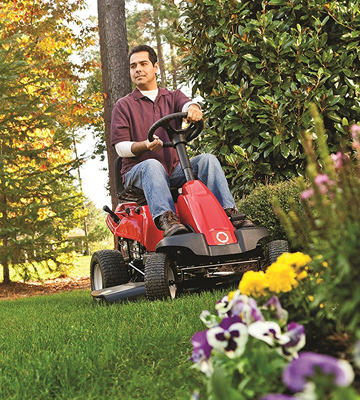 If the lawn is big, flat and smooth, you can opt for a model with a manual type of transmission. It’s well suitable for setting the most accurate speed for short, tall and wet grass. The riders with an automatic type of transmission ideally work on the areas with lots of obstacles, lumps and bumps. As a rule, their turning radius is zero. More than any other riding lawn mowers, they are massively purchased by professional mowers. Now, there are some other things that are of high importance worth your consideration. 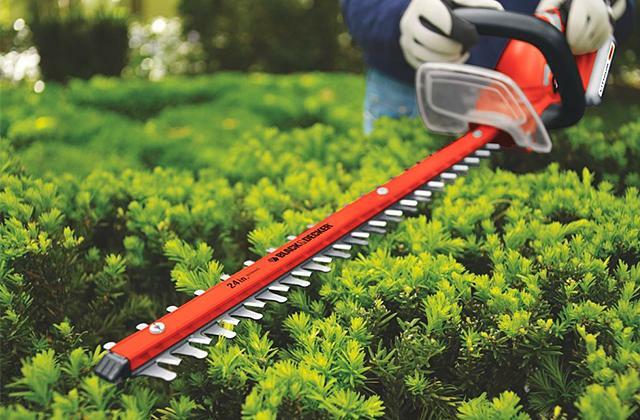 Those consumers who’re seeking for a true powerhouse to mow rough lawns, should definitely pay attention to the following aspects - the cutting width, the number of blades, tank capacity, cutting speed, height adjustment and working modes. Consider the maximum cutting width if you want to cut more grass in one pass. The wider it is, the less circles you’ll have to ride. The riders with a bigger number of blades will better cut the grass without tearing it up. High speeds ideally suit for mowing big areas and rough terrains while the height adjustment allows varying the optimal angle of cut. The riders can also mulch, bag, side-discharge and collect the cut grass, making the whole process much easier. Finally, a consumer should pay attention to lawn mower’s conveniences. Seat dimensions, a steering wheel, lever coating material, a footrest, an armrest, and a cup holder are important for a comfortable use. Furthermore, a water hose connector allows you to clean the mower after its performance. Take into consideration that a folding floor provides a comfortable access to the blades while a fuel indicator helps to control fuel consumption. Besides, an electric blade system provides a quick turning on and prolongs the lifespan of the drive belt. To crown it all, a special indicator alerts you about the necessity to change the oil. 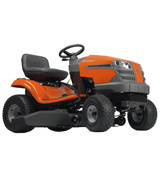 All these conveniences provide comfortable use and timely maintenance of the mower. If you ask us, riding lawn mowers serve as the perfect testament to mankind's ingenuity, with laziness almost always being the biggest driving force behind that ingenuity. We wanted to keep a pristine lawn but we didn't want to put in the effort that was required to maintain that lawn, so we came up with these machines that do the bulk of the job for us. They're effective, they're efficient, and, honestly, they're quite a lot of fun. So, aside from the obvious financial question, why so do many people feel reluctant about switching from a regular lawn mower to a much more efficient alternative? Well, a part of it could certainly be attributed to the good ol' baby duck syndrome, a principle that suggests people often tend to stick with the very first iteration of a particular technology since they believe it to be far superior to everything that came after it. But we all know that, in this case, this is simply false, don't we? Aside from the fact that about 68,000 people suffer all sorts of injuries while operating a regular lawn mower, you'd be hard-pressed to come up with a solid argument that supports the theory that those regular mowers do a better job of taking care of the lawn than riding lawn mowers. And if you don't feel like that is actually the case, here are a few advantages of these types of mowers that may just convince you otherwise. It doesn't matter whether you have a self-propelled lawn mower, a push mower, a reel mower, or even a robotic lawn mower, none of them is capable of offering the same kind of efficiency as riding mowers do. Frankly, any type of mower that requires you to stand behind it doesn't even come close when it comes to getting the job done as quickly as possible. The speed with which you can mow the lawn using a riding mower is simply unparalleled no matter how you slice it. if we're talking about a large yard, one of these vehicles will be able to save you hours every single week. Well, this one is a bit of a no-brainer, isn't it? Unfortunately, the majority of yards are not completely flat, and even if they were, you would still be working a lot harder trying to mow your lawn with a self-propelled model or any other stand behind mower. 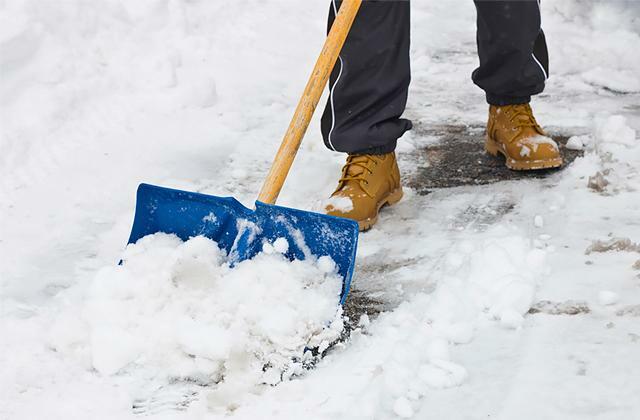 And don't even get us started on those scorching summer days when it feels like you might evaporate after a few minutes outdoors, so the last thing you want to do is push a heavy piece of machinery around your yard for a minimum of half an hour. Besides, taking care of your lawn is a monotonous, tedious task. But a riding lawn mower makes it as exciting as it can possibly be. As much as we all would like to be in an optimal, tip-top condition every single day of our lives, we're afraid the reality is seldom so lenient. Whether you simply do not feel well on a particular day or you happen to have some kind of a long-standing injury, operating a stand behind mower can be simply out of the question. On the other hand, a riding lawn mower is a lot more forgiving when it comes to your health concerns and there's a good chance you will be able to continue maintaining your own yard in the majority of cases unless, of course, we're talking about a critical condition situation here. If the latter is the case, you might want to pay your physician a visit before concerning yourself with gardening matters. 1. Riding Mower Buying Guide, Lowe'S. 2. Roger Cook How to Choose a Riding Lawn Mower, This Old House. 5. Evan Gillespie Diesel Lawn Mowers Vs. Gas Lawn Mowers, SFGate. 6. Tessa Miller How Often Should You Mow a Growing Lawn? Lifehacker. October 8, 2013. 7. Roy Berendsohn How to Mulch Leaves With a Lawn Mower, Popular Mechanics. November 26, 2012. 8. 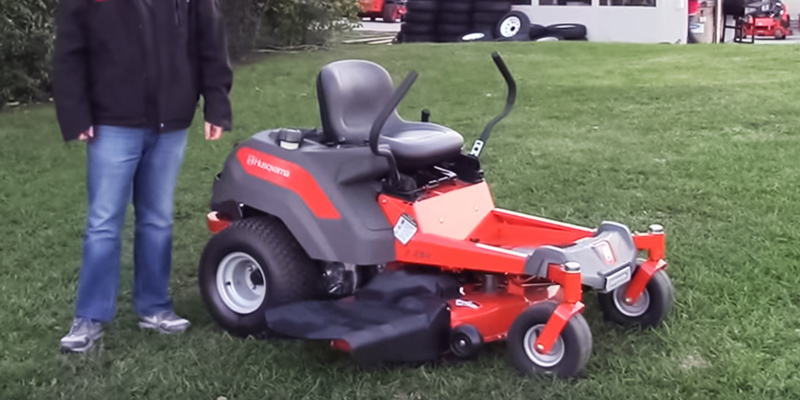 Things to Consider When Buying a Riding Lawn Mower, Husqvarna. 9. Abby Tripp Heverin Riding Mower Buyer’s Guide, Hobby Farms. April 26, 2013.